The Eritrean cargo ship "M/V Den Den" which ran aground and later capsized off Tanneerubavi near Mangalore on Saturday. 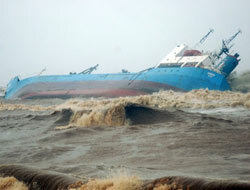 The Eritrean cargo ship "M/V Den Den" which ran aground and later capsized off Tanneerubavi near Mangalore on Saturday. Two of the crew drowned in the rough seas while trying to escape in rubber dinghies. 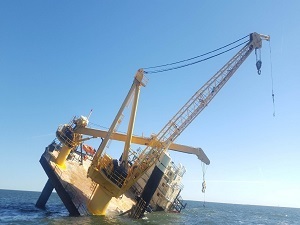 As feared earlier, the West African ship "DenDen" which was caught in the middle of the sea near Tannir Bavi here has at last been completely swallowed by hungry sea. All the efforts to pull the ship to the shore failed as ship sunk in front the eyes of thousands gathered by the spot. As reported earlier out of the total 24 persons in the ship 2 persons have already died and 3 are in serious condition while 14 more have been rescued. But as of now 5 persons are still missing and they have not been spotted after they jumped into the sea when it sunk. 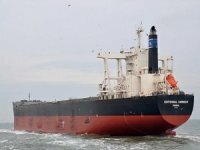 'DenDen' ship from Eastern African country Eritrea was on its way to Dubai after loading furnace oil from KISKO on Tuesday June 19. But no sooner it left the shore, a technical snag was reported. As a result ship was anchored in the sea, a few nautical miles away from NMPT. Abraham Kuhan, a native of Ghana who is the cpatain of the ship declined technical help saying that they were able to set the snag right. But the ship moved towards Tannir Bavi shores owing to storm on Friday June 23 night and submerged in the sea. There were 3 Pakistanis, 16 Eritreans, 2 each from Sudan, Ghana and one from Sri Lanka. The present situation is that people are thronging in thousands to the shore. Local fishermen have been of great help since they took initiative to rescue the trapped crew of the ship. Though the names of all of them are not available sources confirmed that Tamrat, Yakoob, Immanuel, Ilias, Abraham Kuhan and Birhane were among the crew. 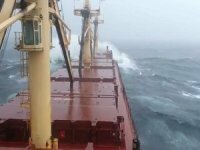 Two sailors died and 12 others were injured when an Eritrean cargo ship, M.V. Denden, sank near Thanveerbavi beach near here on Saturday . The ship was carrying furnace slag to Dubai from Mangalore. 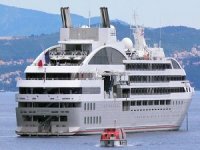 Twenty-one crew members were safe while one was reported missing. The ship first reported trouble at 9.30 pm on Friday, when Captain Abraham Kwaw, from Ghana, sent a message to the Coast Guard, which was also received by the police and at the New Mangalore Port. 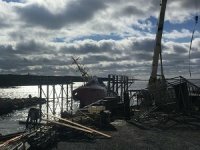 But when the Coast Guard offered to help, he said the crew were able to sail after effecting repairs in the engine room. Later, at 11.30 p.m., the Captain sent an SOS, and Additional Superintendent of Police B.S. Lokesh Kumar and the Coast Guard responded quickly. The Captain again refused help, saying he was hopeful of getting the ship going. But on Saturday morning, the ship was sighted drifting by fishermen,and at 6.45 a.m., it started tilting. This was when the crewsentanother SOS, but by then the ship was stuck in the sand just 300 m from the shore and was showing signs of capsizing. Attempts were made to airlift the crew but were abandoned due to bad weather. 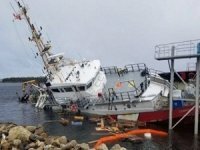 Coast Guard ship Annie Besant tried to approach the ship, but quit as it was too close to the shore.